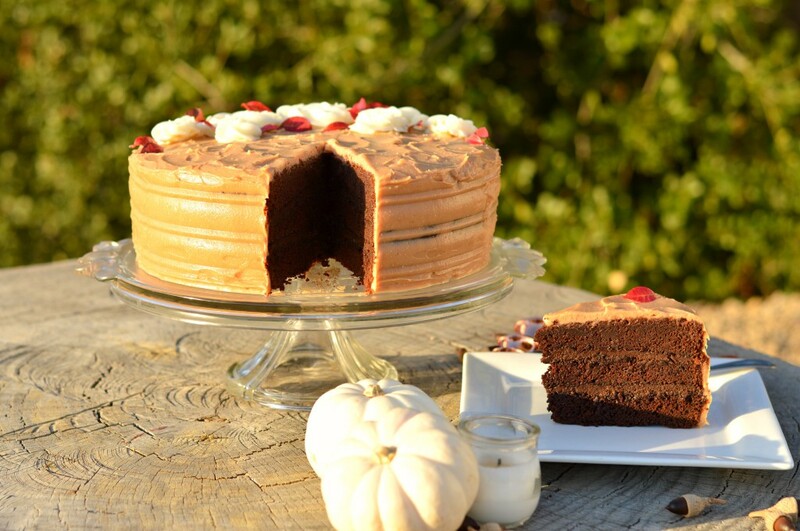 Every Fall party should have a decadent Chocolate Caramel Cake!! You guys! This cake is simply to die for!! If you don’t already know by now, I absolutely looooovvvee caramel!! 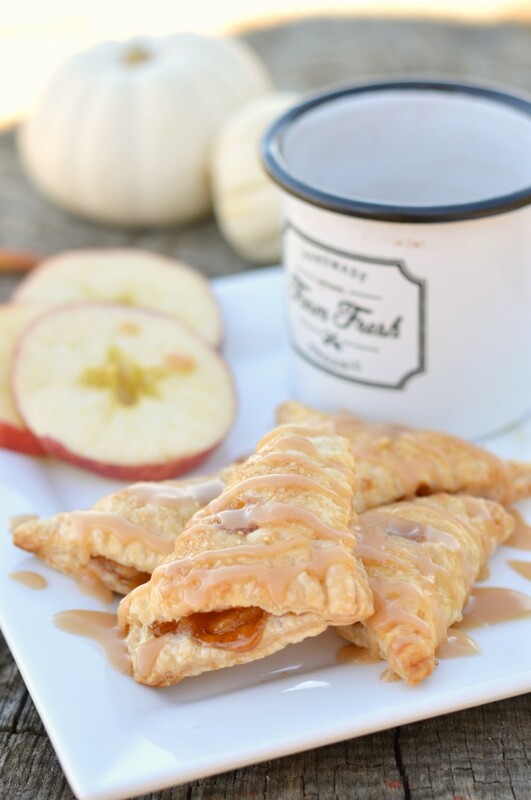 It’s my absolute favorite, I could literally eat caramel sauce by the spoonful! 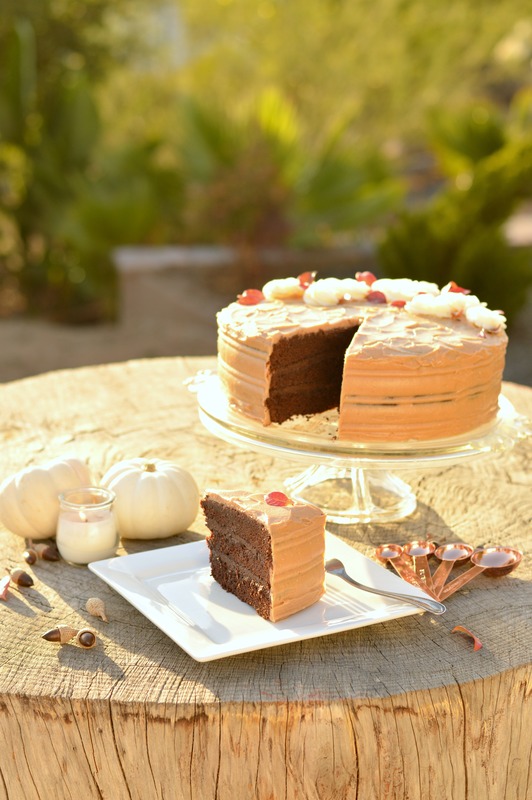 This past weekend my sister celebrated her birthday, and ordered this chocolate caramel cake as her birthday cake (perfect right?!?). It’s become a tradition in our family that the birthday person gets to choose their own cake. 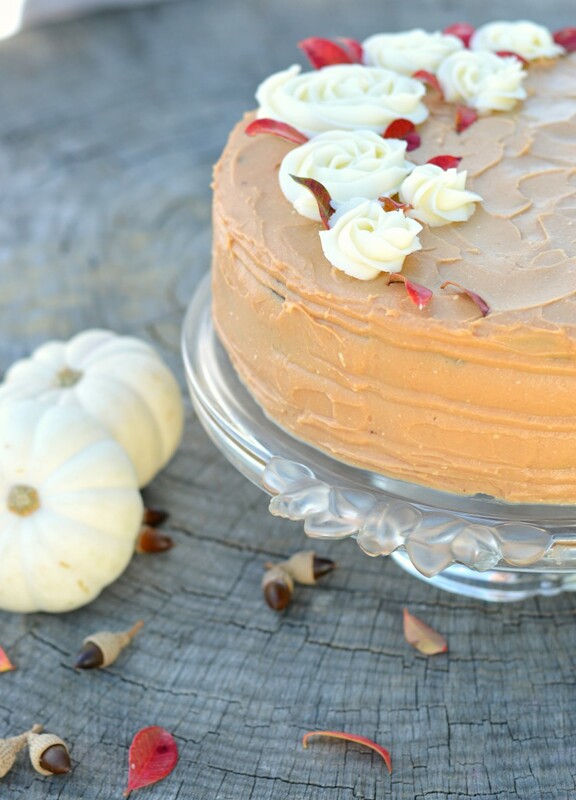 Now in the past, when I just started experimenting with homemade cakes, it was a bad idea to want a homemade cake, because sometimes you would end up with a ruined birthday cake. Yes, I’ve sadly ruined a few of my sister’s birthday cakes (especially the decor part….). But I’m happy to say that I’ve gotten a lot better, and now we can enjoy a normal, yummy birthday cake. Like this chocolate caramel one. I actually got very excited about this cake as I was making it, because I knew it was going to turn out so delicious! And it did! One thing that helped was nailing that homemade caramel sauce. If you’ve ever made homemade caramel sauce you know that you have to boil it until you reach the perfect color. I’ve had a caramel sauce that was too light and sweet, another too dark and bitter, another…you get the point. This was was just right! But wait, it wasn’t just plain caramel sauce on top, this was a cream cheese caramel sauce!! 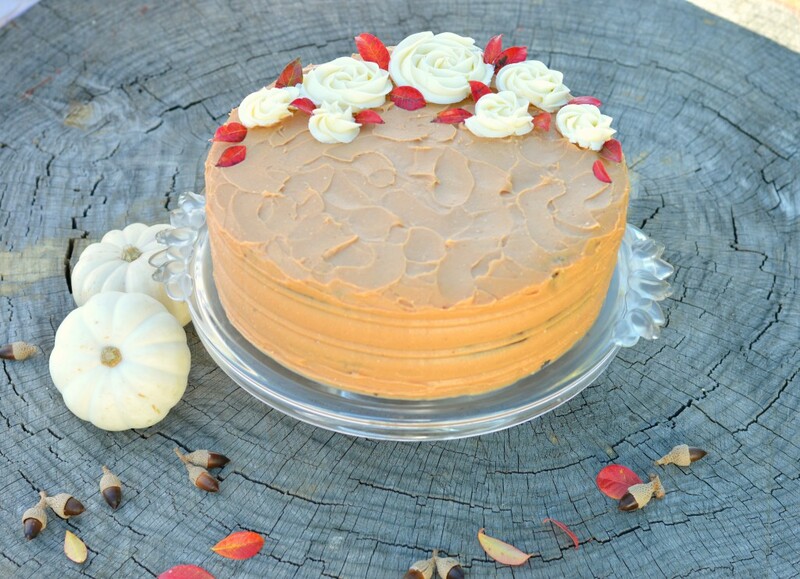 So if you mix caramel sauce with cream cheese, you basically end up with the dreamiest cream cheese caramel frosting EVER!!! What a perfect way to start Fall!! 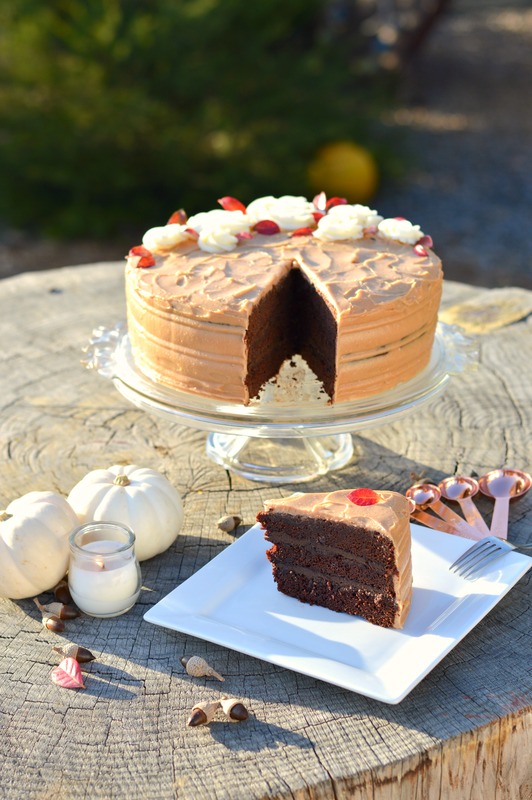 This cake is begging you to make it as soon as you possibly can!! It’s too delicious not to! And shout out to the birthday girl who decorated the cake herself! Isn’t she so talented? Preheat oven to 350 degrees F. Grease and flour two 9” round baking pans (I used one 10 in. pan). Place all ingredients in electric mixer bowl and beat on high speed for 3 minutes, scraping down sides of bowl once during mixing. 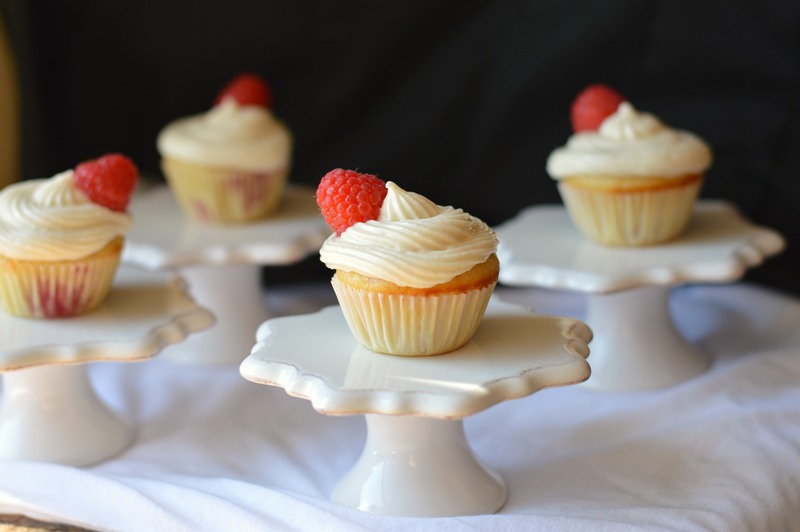 Pour into prepared pans or cupcake cups. 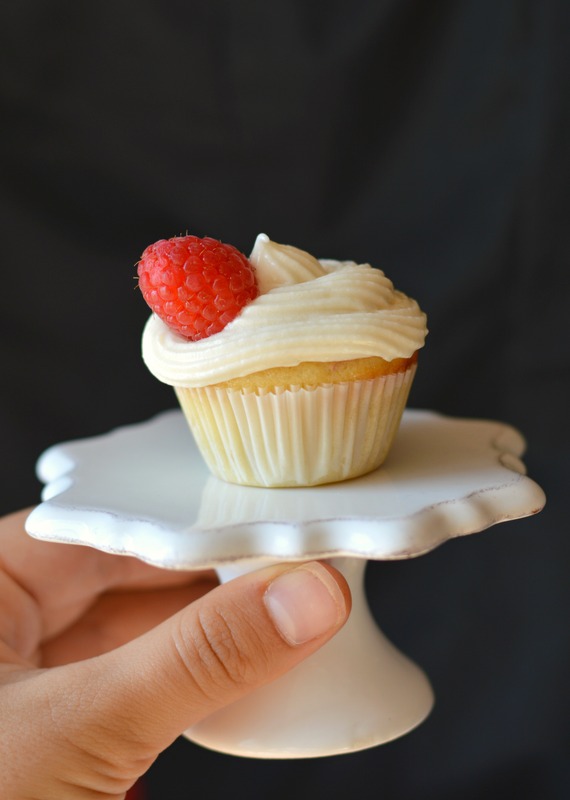 Bake cakes for about 55 minutes or until toothpick comes out clean. While the cake is baking make your caramel sauce. In a large non stick sauce pan combine the sugar and water, cook over medium low heat until the sugar dissolves without stirring ever! Just swirl the pan around. 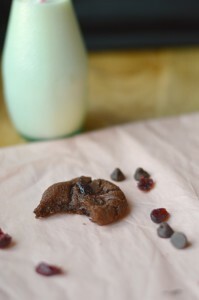 Once the sugar has dissolved, turn the heat to medium high and let it bubble away until it turns a deep amber color, about 8 to 10 minutes. Turn the heat down to low at this point and add the warm heavy cream slowly. Be careful because it will bubble vigorously. Keep whisking until everything is combined and turn the heat off. Add the butter, salt and vanilla and whisk in until the butter melts. Set aside to cool completely. After the caramel sauce has cooled, measure 1 3/4 cup of your caramel sauce and mix with 8 oz. of cream cheese. Leave the leftover caramel sauce to drizzle on top. To make the chocolate fudge filling, in a mixer combine all ingredients and over low speed for 30 seconds. Increase speed to medium and beat for 1 minute until smooth. Add the melted chocolate chips and mix until combined. 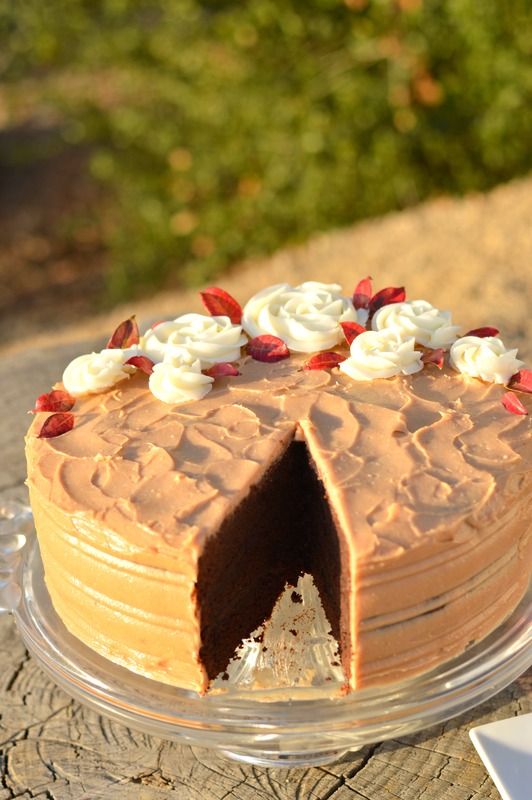 Let frosting cool for 15-20 minutes before using on the cake. To assemble the cake, cut your cake in 3 layers lengthwise. 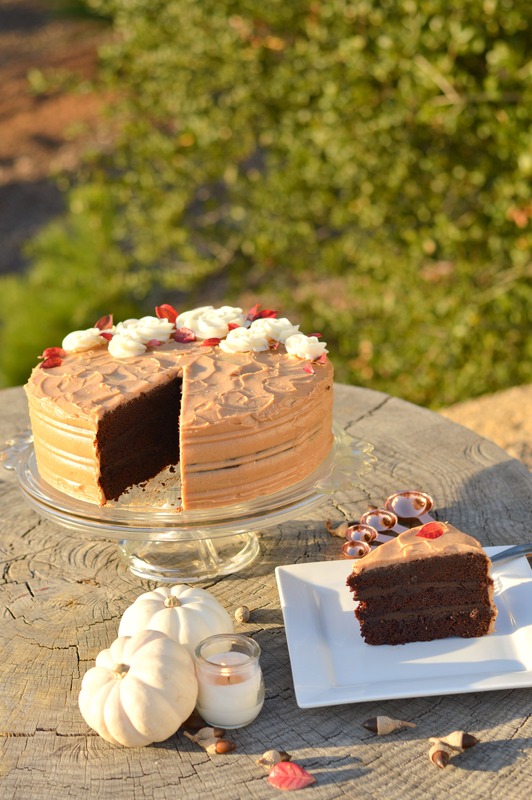 Place one layer of the cake on your cake stand and spread half of the fudge frosting evenly on top. Add another cake layer on top and evenly spread the remaining fudge frosting on top. Place the top layer on. 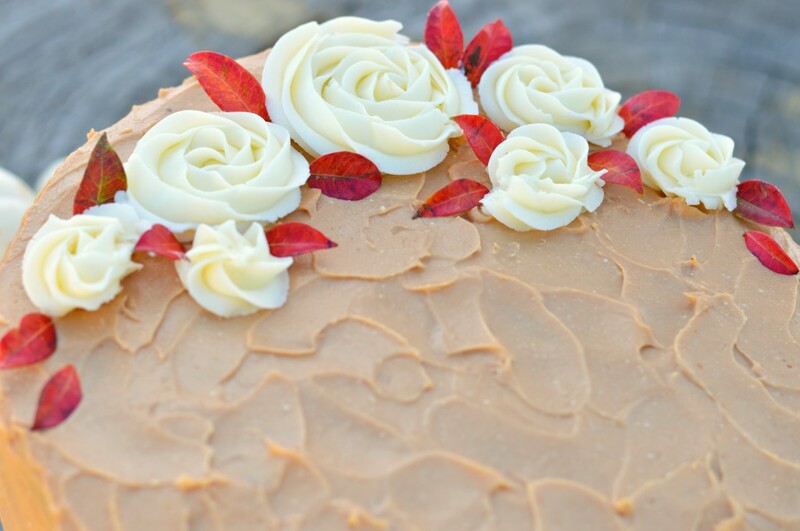 Evenly spread your cream cheese caramel frosting all over the top and sides. At this point you can decorate the cake however you want. Slice and enjoy!! 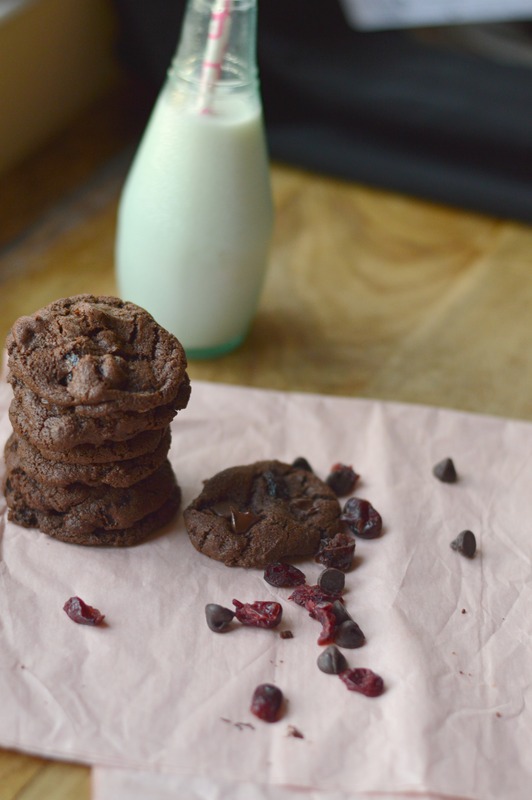 When a gluten free desert doesn’t taste gluten free, you know you’ve got a winner!! 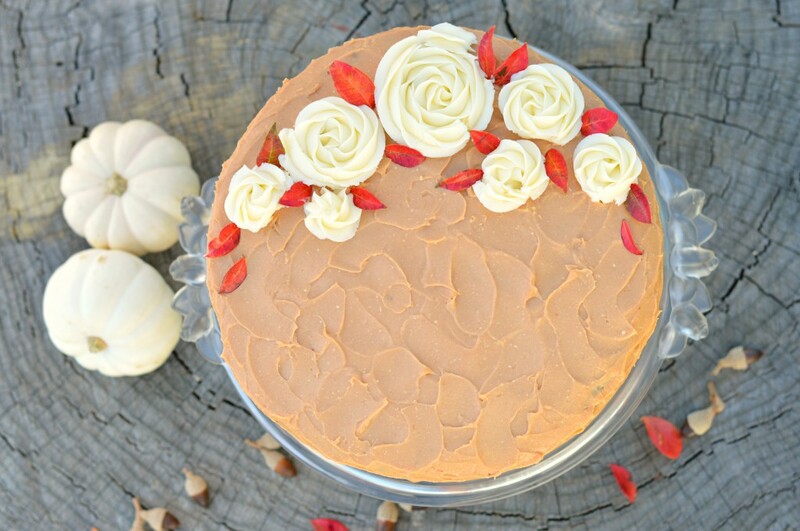 While I’m excited for all the Fall baking, I have to say I’m sad to say good-bye to summer, my favorite season! I feel like it passed by so fast this year!! Actually, all of 2016 passed by so, so fast, I can’t believe we’re close to the holidays again! Last weekend we attended our neighbor’s annual end of summer party, and I brought this gluten free marble cake (since I knew that some people who were coming were GF) and I have to tell you, it was a big hit! People dug right into it even though some weren’t gluten free, and after the party around 8 p.m. my neighbor texted me a picture with her eating more of this cake. 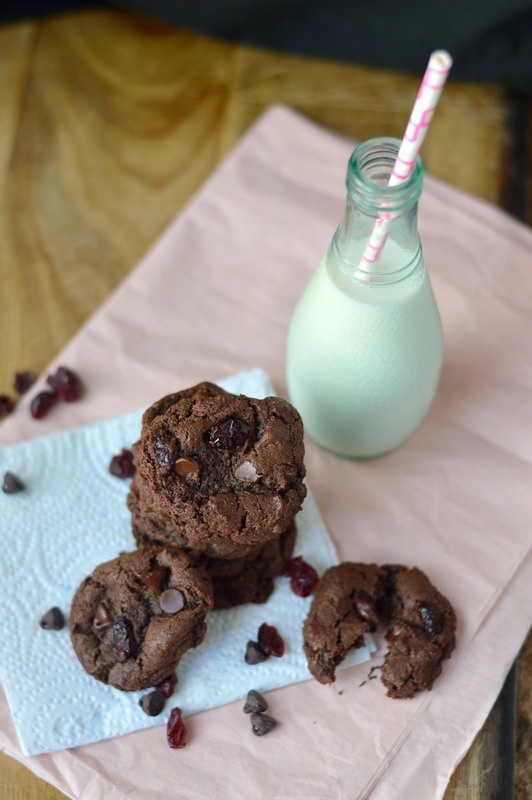 This is one of those gluten free desserts that doesn’t taste sandy and yucky (like some tend to do). It’s so light and fluffy, and absolutely delicious. Last time I brought it over to them I drizzled chocolate ganache on top, and added blueberries and strawberries. 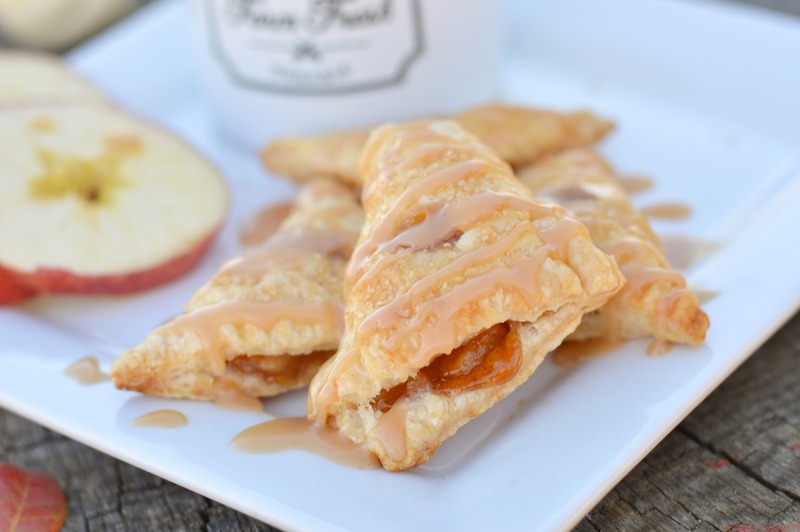 This time I wanted to make it over the top, so I drizzled CARAMEL sauce!!! 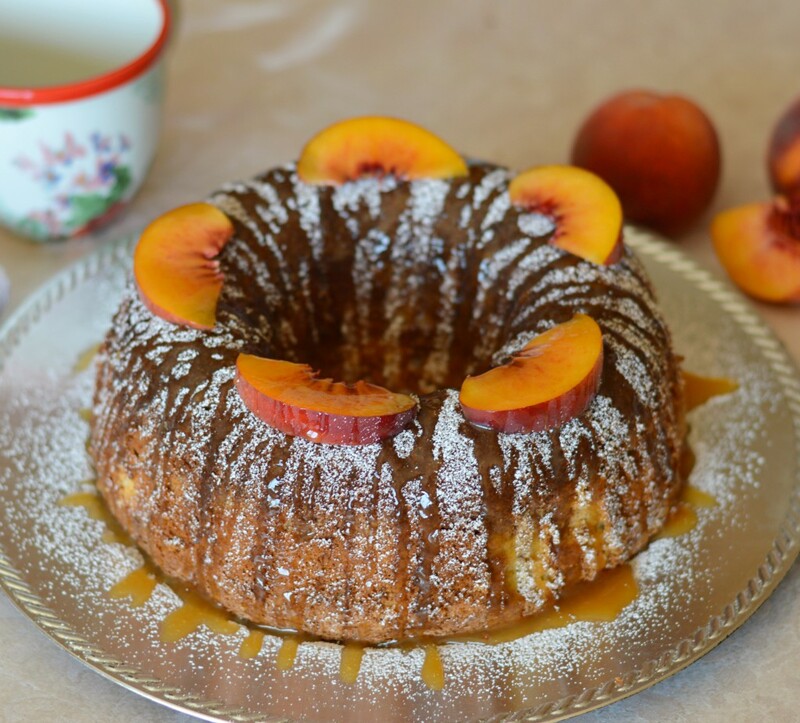 (insert all the heart eye emojis here ) I have a big weakness for caramel sauce, and this was the perfect touch of flavor to this amazing marble cake. Also, the peaches added such a great balance and extra fruity flavor. Do yourself a favor…end this summer with a bang by making this cake!! 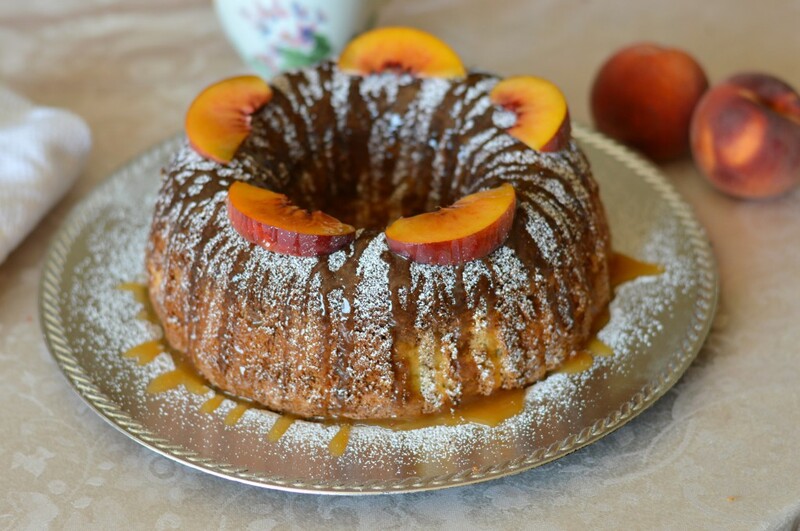 You HAVE to drizzle that caramel sauce on top,and top it with peaches, it’s simply the greatest!! In a small bowl sift together the flour, baking soda and salt (adding a few drops of lemon on the baking soda before you sift it) and set aside. Separate the egg yolks from the whites (placing the egg yolks in a large bowl). Whisk together the egg yolks with the sugar (pouring the sugar slowly). Add the vanilla, and then pour the oil gently while whisking. Afterwards add the milk. 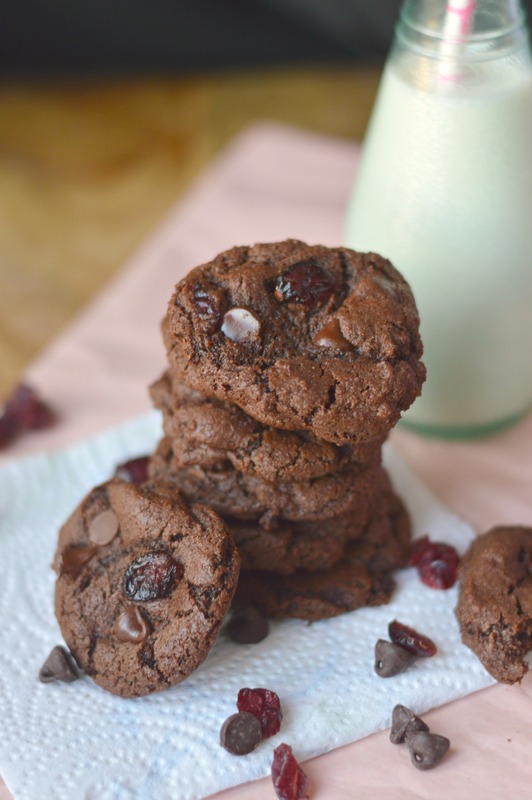 When mixture is smooth and homogenized, sift the dry ingredients while adding them to the wet ingredients, and mix slowly with a spatula until fully incorporated (do not mix this part with an electric mixer!!). In a separate bowl mix the egg whites on high with an electric mixer until they become fluffy and stiff peaks. Slowly mix the egg whites into the batter with a spatula until fully incorporated. Grease and flour a bundt pan. Pour 3/4 of your batter in the pan, saving the rest in the bowl. In the remaining batter add about 2-3 Tbsp. of cocoa powder (depending how dark and chocolaty you want it, you can add more or less), along with the rum essence and stir until fully incorporated. Drizzle the chocolate batter in ribbons over the vanilla batter, and with a butter knife swirl the batter around to create a marble pattern (be careful that you don’t over mix and make it all chocolate ). Bake at 350 degrees F for about 40-45 min. or until a toothpick inserted in the center comes out clean. 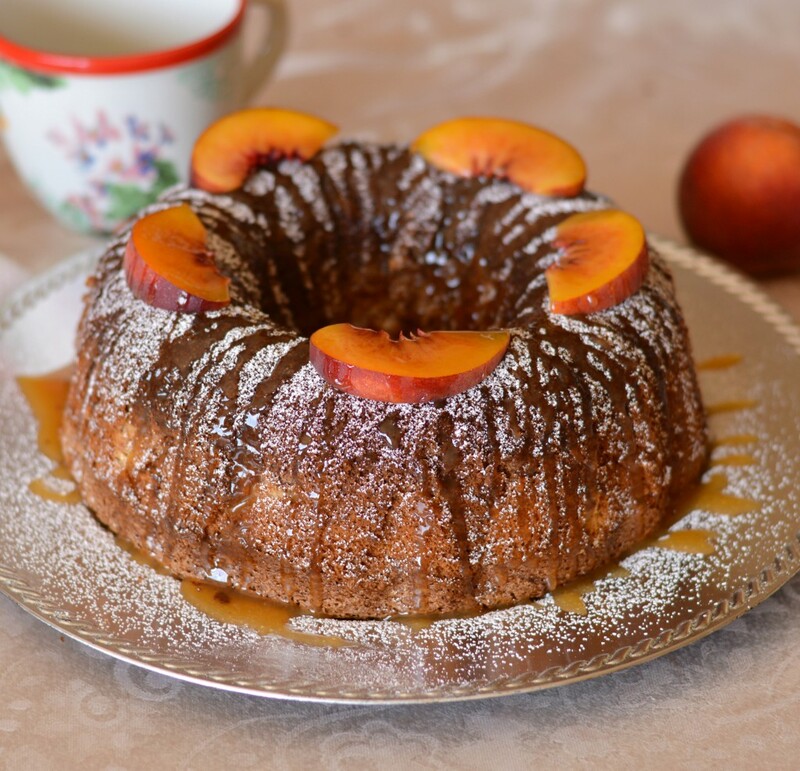 Allow the cake to cool before sprinkling with a little confectioner’s sugar (optional), and liberally drizzling it with caramel sauce. 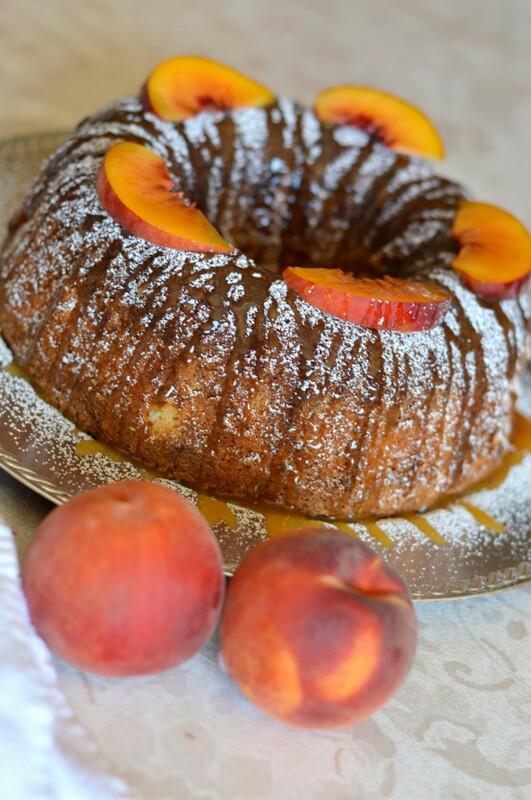 Add the sliced peaches on top, serve and enjoy!! 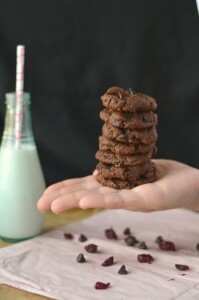 They may look small, but they’re one bite of pure decadence! 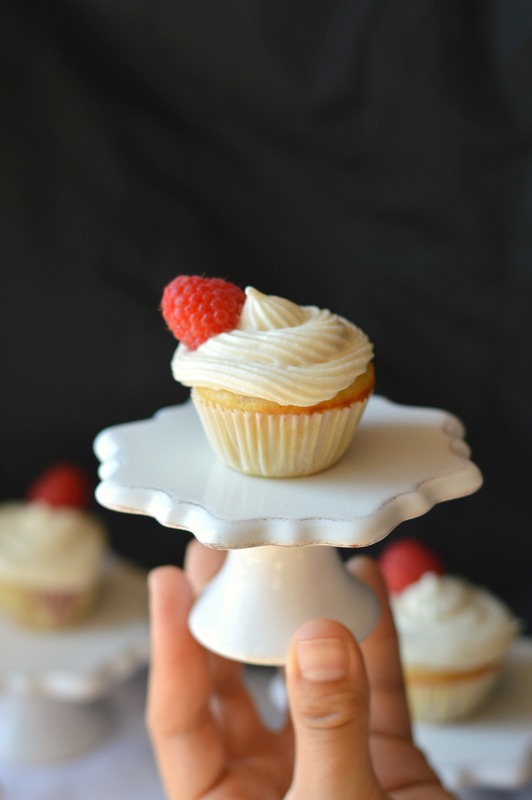 So as I was thinking about what dessert to bring to a friend’s dinner, my sister came up with the idea of these blueberry lemon cupcakes , and I thought about making a cream cheese frosting with them. Then, as if a light bulb churned on, I suddenly thought “why not substitute raspberries for the blueberries?” Brilliant!! So of course, even though I had an idea of how they were going to taste/look, I decided to test the recipe ahead of time to see how they will really turn out. And yes, who doesn’t love a good excuse to eat a cupcake?? Thankfully, the recipe was a huge success, and everyone loved them!! 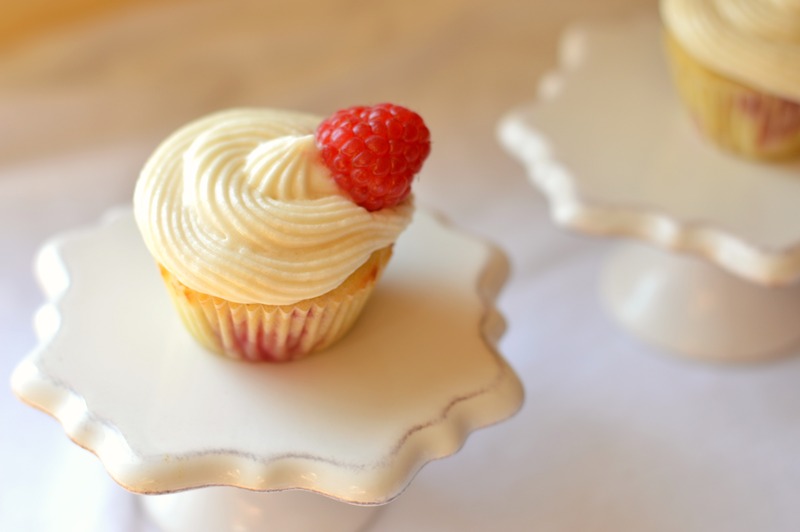 The raspberries go so, so well with the lemon cupcake, and that cream cheese frosting just elevates it to a whole new decadent level of cupcake! Oh, I hope you give these a try! They look so pretty for being so easy to make! They’re the perfect summer treat (celebrate summer until the very last day!!!) 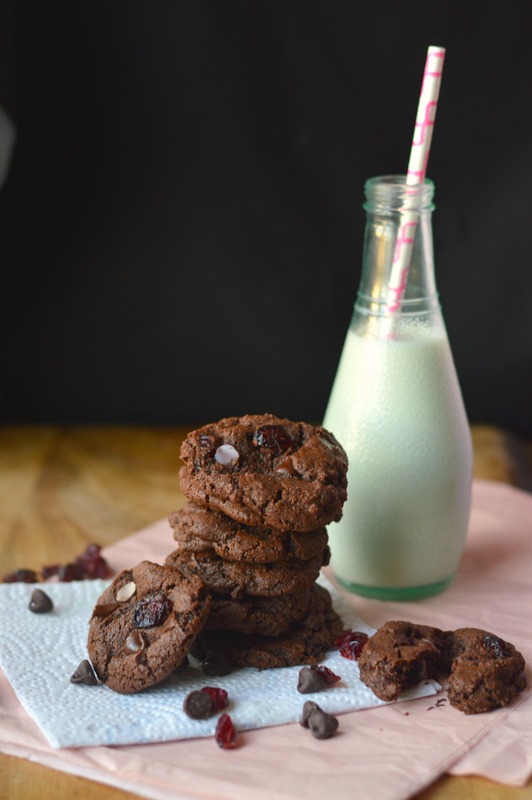 and when else do you have that extra little bit of time to make a yummy and gorgeous dessert? Especially since raspberries are in season, your cupcakes will turn out two times better!! 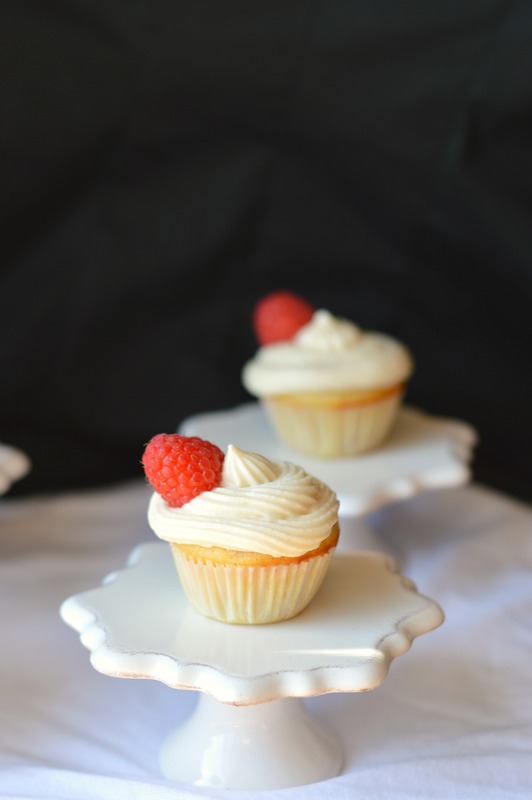 Try these today, and then you can pretend you won Cupcake Wars! In a large bowl sift together flour, baking powder and salt; set aside. In a large bowl, whisk together the yogurt, sugar, eggs, lemon zest, vanilla and oil. Slowly whisk the dry ingredients into the wet ingredients. 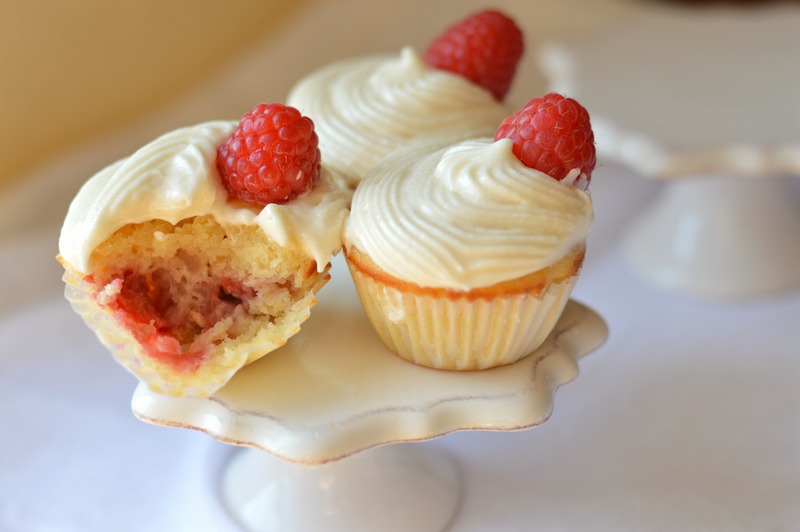 In a separate bowl, mix the raspberries with the remaining tablespoon of flour, and fold them very gently into the batter. Divide batter evenly in your mini muffin pan. Bake at 350 degrees F. for about 10-12 min. or until toothpick inserted in the center comes out clean. 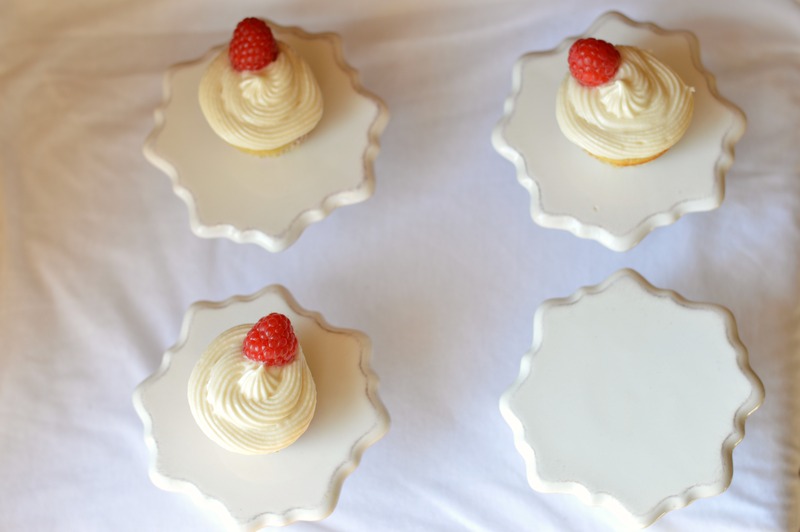 Allow the cupcakes to cool completely before frosting them. To make the cream cheese frosting, cream together the butter and cream cheese with an electric mixer. Slowly blend in powdered sugar and vanilla, and mix until smooth. 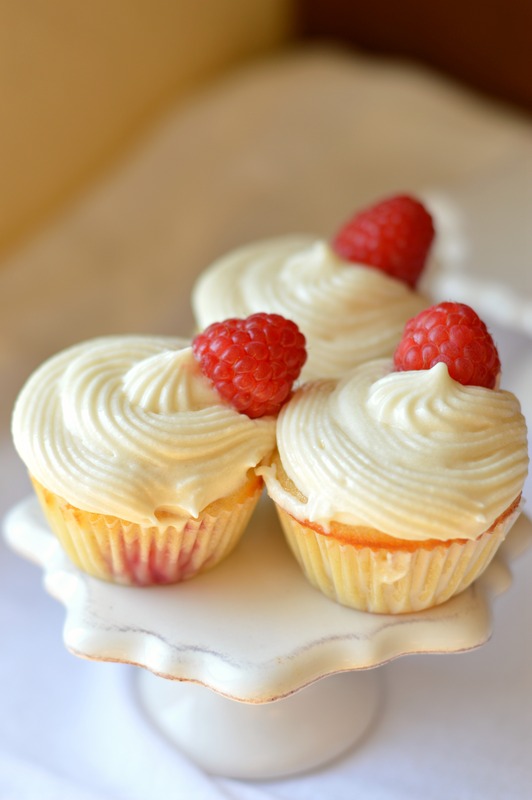 If frosting is a little on the runny side, place in the refrigerator for about 5 min. before using. To frost the cupcakes, fill your piping bag with frosting fitted with a small rosette tip. 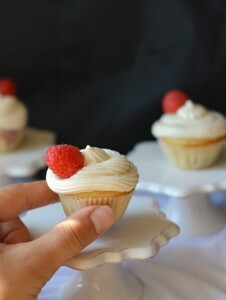 Frost each cupcake and top with a raspberry. Enjoy! 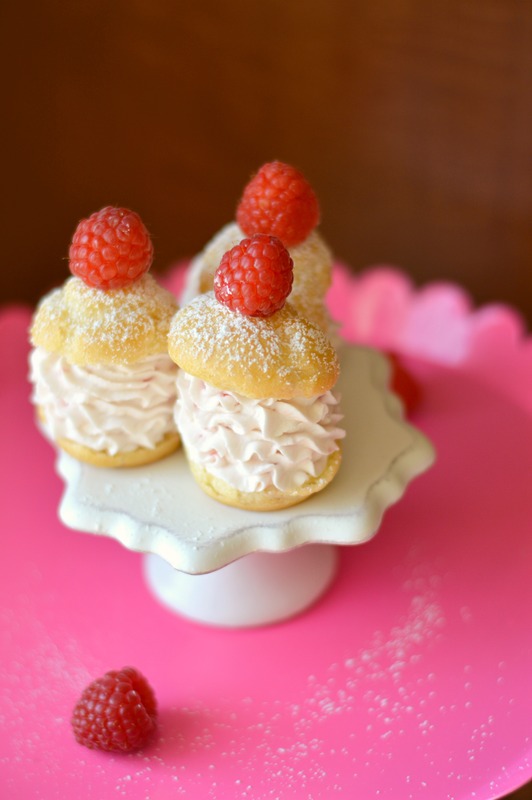 These darling sweet puffs are done in a matter of minutes, and they are a showstopper!! Summer is my favorite, and raspberries make summer so delicious!! I want to put them in all my desserts!! My youngest sister really loves raspberries! Seriously, I have to closely guard my raspberries or else they’ll be gone if I turn my back for a second! Of course, I’m a good sister and give her any extra leftover raspberries. 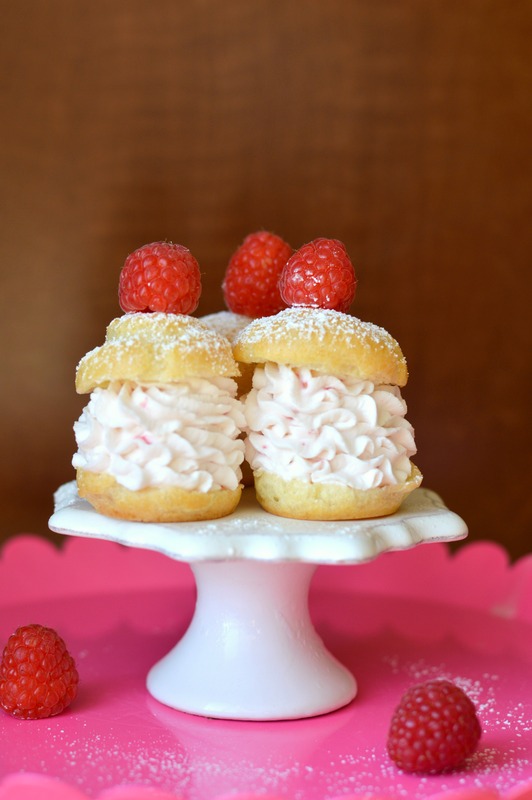 My oldest sister on the other hand, really loves cream puffs and raspberries, so you can imagine that these Raspberry Cream Puffs were right up her ally! Actually, the whole family really loved them! I love how versatile cream puffs are. You can fill them will lots of different things like, vanilla and chocolate pudding, plain whipped cream (and other fruit flavored whipped cream), and tons of other ice cream flavors. 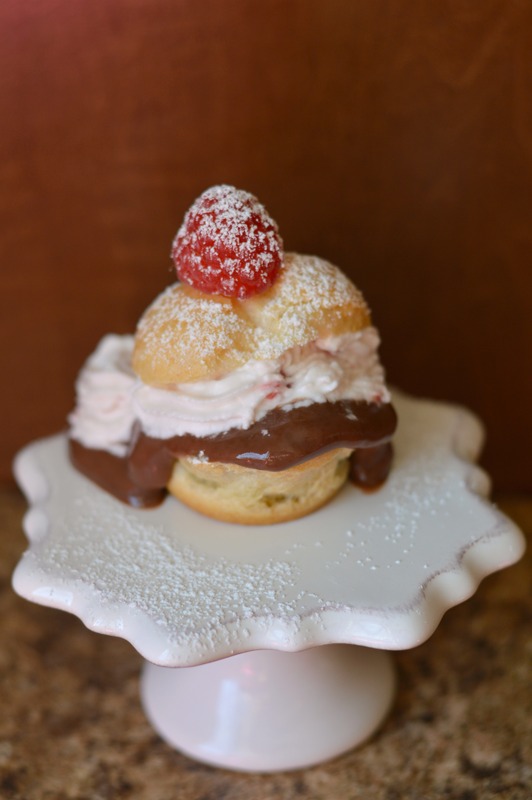 The best part about cream puffs? They’re so delicate, and look so pretty and fancy no matter what you fill them with! And they couldn’t be easier to make! Thank you French people! As you can see, this one was filled with both raspberry whipped cream and chocolate pudding. Simply to die for!! What could be better than combining the two together?!? Even if it looks messier, it just means it’s yummier!! 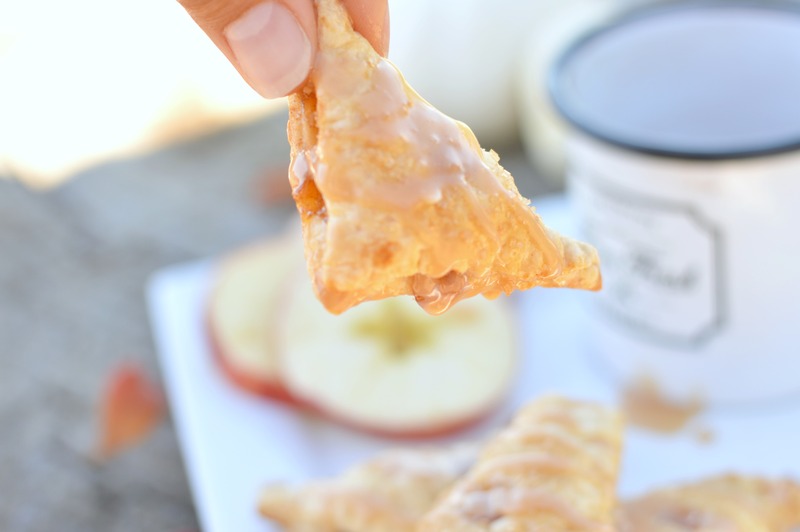 You have to try these the next time you have guests over!! You’ll look like a professional French chef! Bring water, butter and salt to a boil in a saucepan. Add the flour all at once; stir briskly until the mixture leaves the side of the pan and forms a ball. Remove from heat; let stand for 5 minutes to allow mixture to cool before adding the eggs. Beat well after adding each egg. Continue beating until mixture is smooth and shiny. Drop dough 3 in. apart onto a greased baking sheet. Bake at 400 degrees for about 20-30 min. or until golden brown. 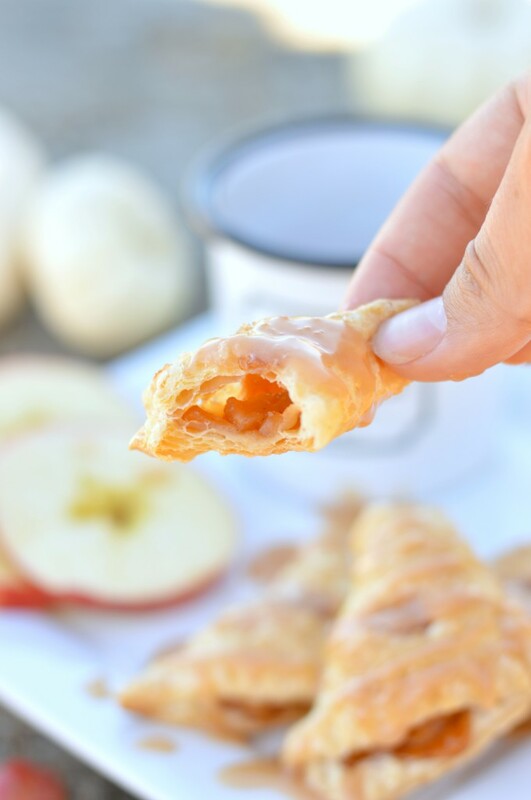 Allow the puffs to cool completely before filling. To make the filling, whip the heavy cream until stiff peaks while slowly adding the powdered sugar. 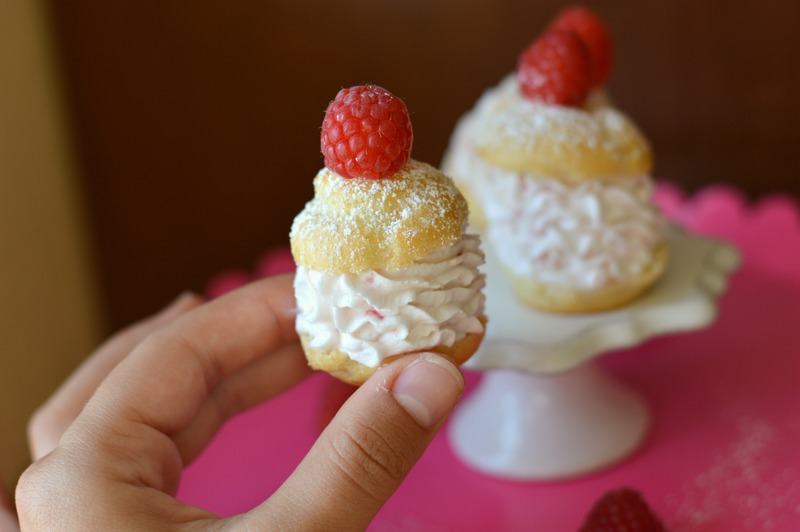 Fold in the raspberry puree, carefully making sure that your whipping cream doesn’t become too fluid, and still maintains its stiff peaks. So you can gauge it by starting with 1 cup, and gradually increasing if necessary. To assemble, cut the puffs in half lengthwise, and set tops aside. 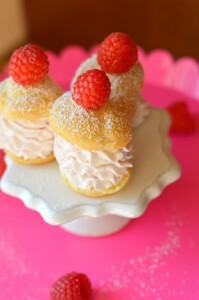 Fill a piping bag with fitted with a rosette tip, and pipe the whipping cream into the bottom half of each puff. Gently place the top of the puff on top of the whipping cream. Dust with powdered sugar, and enjoy!! 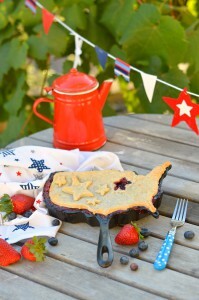 What can be more American than an American pie? 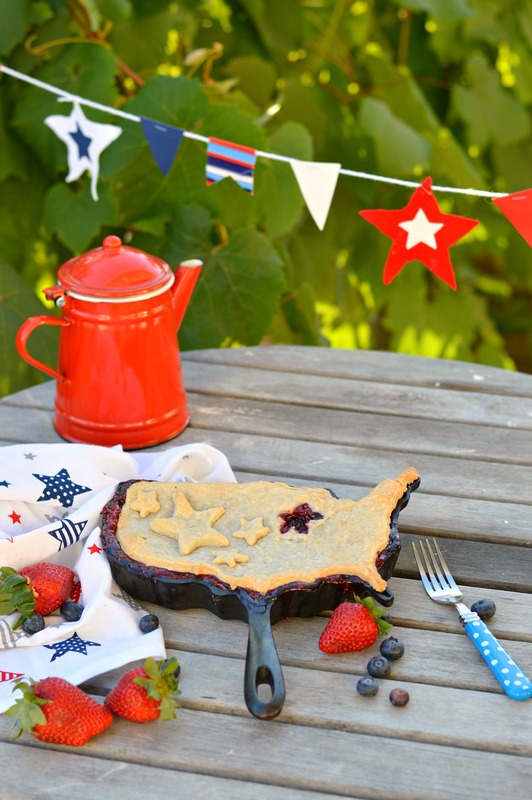 A juicy multi-berry pie with ice cream, or a real apple pie, on a warm summer day, with the flag waving in the breeze, and in the evening fireworks bursting in the sky! 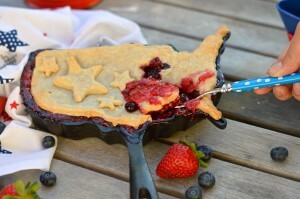 But I took it up another notch this time, and I now have the most American pie…it is pie made in an American Skillet! 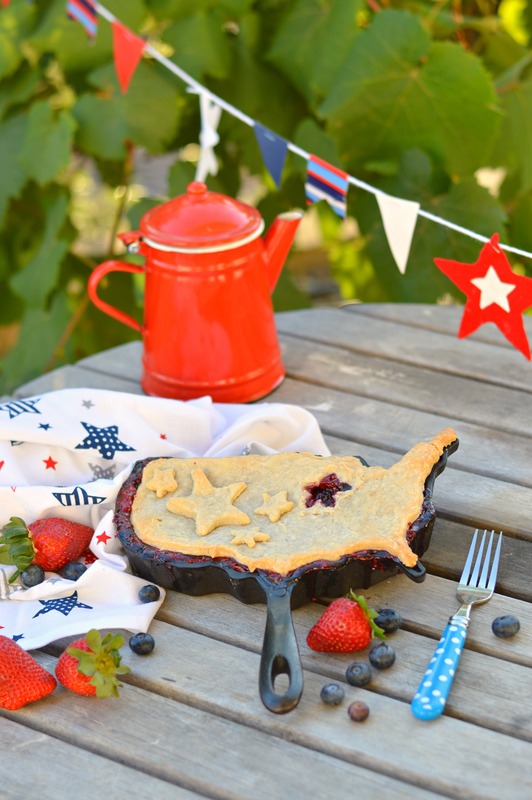 I am thrilled and honored to partner with American Skillet Company to show you a patriotic All-American cooking you can do for this 4th of July! The American Skillet Company has these adorable and unique skillets that are the shape of every state! 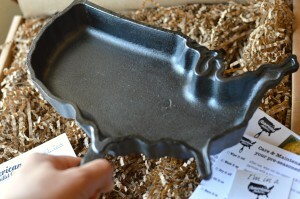 And, they have a skillet the shape of the whole United States! Talk about patriotism! Not only that, but they are manufactured right here in the USA! Authentic American made. These lovely skillets have even been featured on the Today Show! My favorite is the United States of America shape. 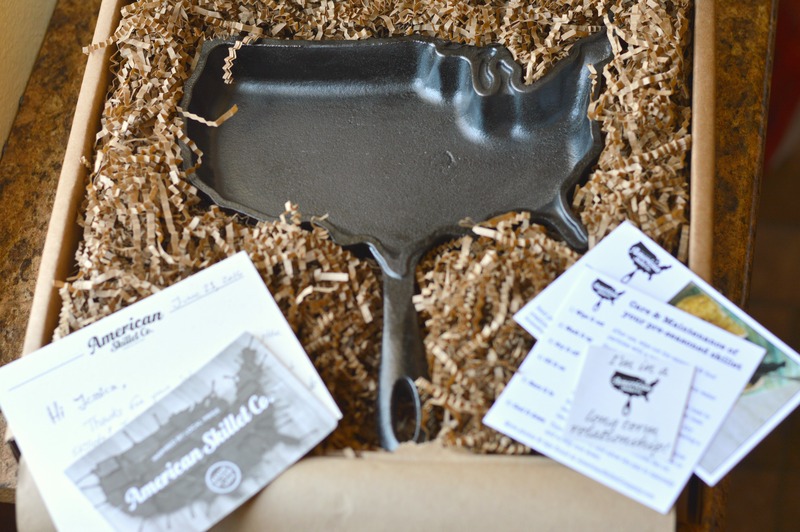 American Skillet Company sent me the skillet and, because I am a baker, I set to making something deliciously sweet in a skillet. You guessed it- pie! 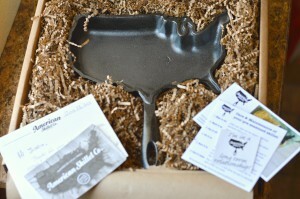 I couldn’t help taking a picture of the box with my new skillet in it! Eee! And I had a lovely note from the founder of the company, Alisa Toninato inside the box too. The skillet is pre-seasoned, so you can start cooking in it right away! No prep or anything! This is great for newbies who are just getting familiar with skillets, or when you have last minute guests and you want to cook asap. 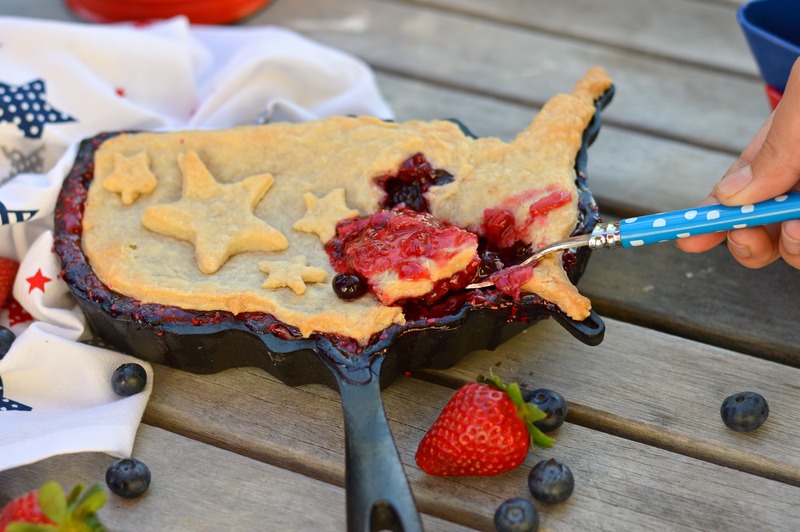 This skillet will easily steal the show on your 4th of July party table! Just look at how perfectly American and charming it looks! The pie turned out delicious in the skillet and the possibilities for cooking in this skillet are endless. From mac ‘n cheese to omelette, to chili….oh, nearly anything you can imagine, you can cook in this skillet. I already have several other recipes in plan which I will be cooking/baking in my favorite skillet. 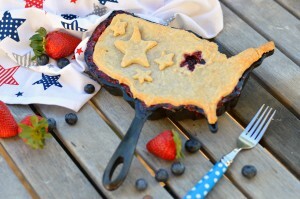 or in the shape of USA, and get cooking! for your mom or dad, or anyone in-between! Give this awesome company a follow on Facebook and Instagram! 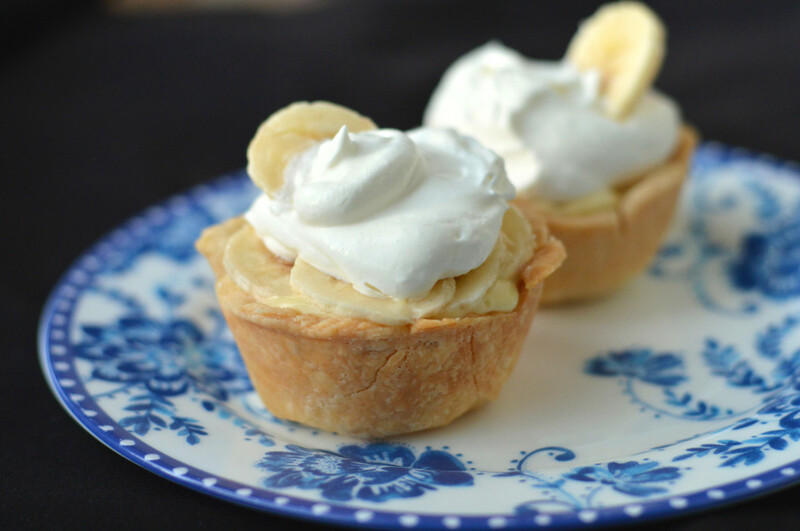 For the Crust: Mix the water, vinegar, and vanilla in a small bowl and place in the freezer. In a large bowl mix flour and salt. Cut butter into flour with a pastry cutter until you have pieces the size of peas. Add the cold vinegar/water mixture. Mix until dough forms. If it’s too dry add a little more water until dough comes together. Wrap dough in plastic wrap and place in fridge for 1 hour, or in freezer for about 15-20 min. For the filling: In a large bowl place the fruit, sugar, lemon juice and arrowroot powder and mix until combined. Place mixture in a medium saucepan over medium low heat and stir until mixture thickens. Allow the mixture to cool. To assemble the pie, roll out your dough on a floured surface about 1/8 in. thick and place in you pie dish. 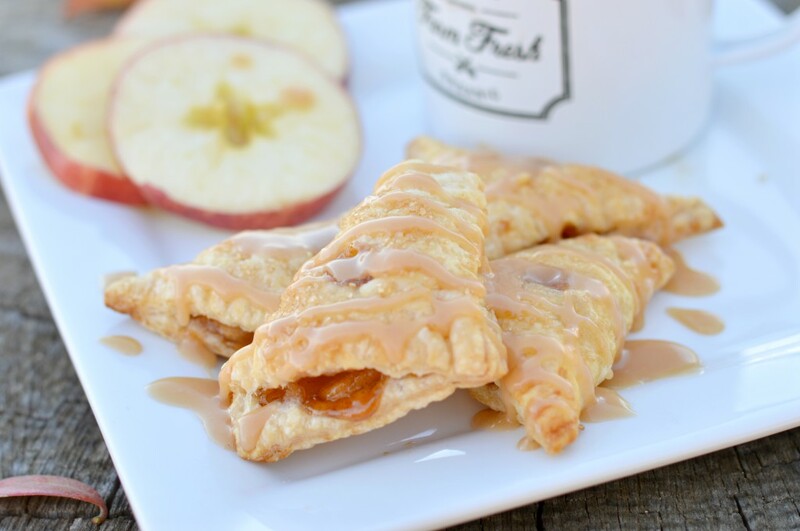 Pour the filling over the dough. Roll out the remaining dough and place over your pie dish crimping the edges together. Cut a slit in the top of your pie to allow steam to escape while baking. Bake at 350 degrees for about 30-50 min. 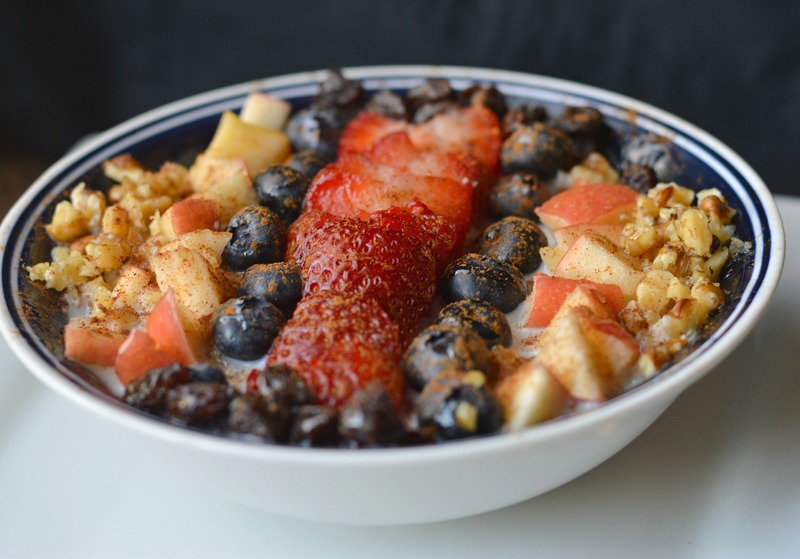 On a scale of 1-10 how much would you rate your love for oatmeal? If you answered in the lower five numbers, I don’t blame you. Although I never hated oatmeal, it’s never been my favorite breakfast option. That’s why I always say that I like toppings with oatmeal instead of oatmeal with toppings. I would eat oatmeal occasionally, and I pretty much liked it (of course so long as I had my many toppings on). 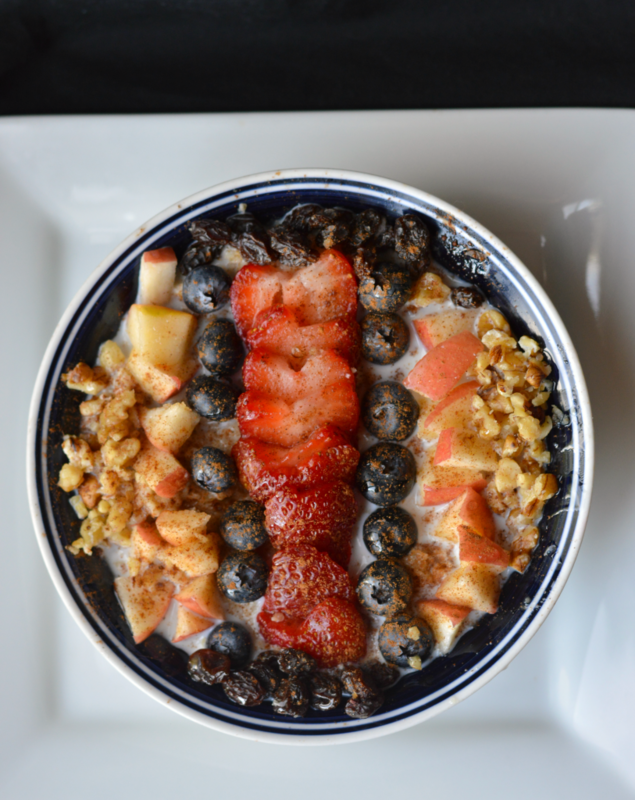 But then my sister came up with an idea that brought oatmeal to a whole new delicious level! Instead of boiling the oatmeal in water, cook it in milk. BOOM! Flavor change on the spot! 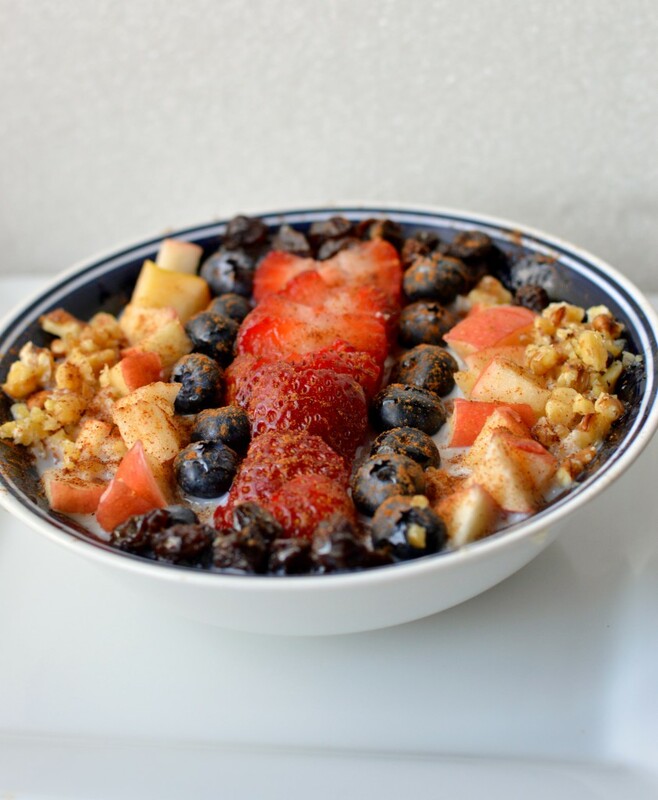 Bye, bye watery tasteless oatmeal, we are adding some delicious creaminess to you! Oh yeah! 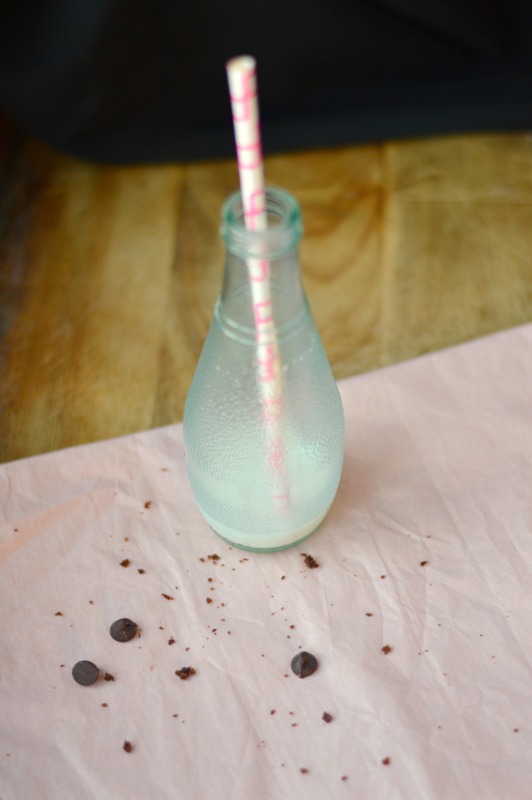 Also, adding a touch of vanilla extract will bring it from amazing, to fabulous. Not only are we making our oatmeal creamier by cooking it in milk, but we are also adding a lovely vanilla-y flavor to it that almost makes it taste like a custard. 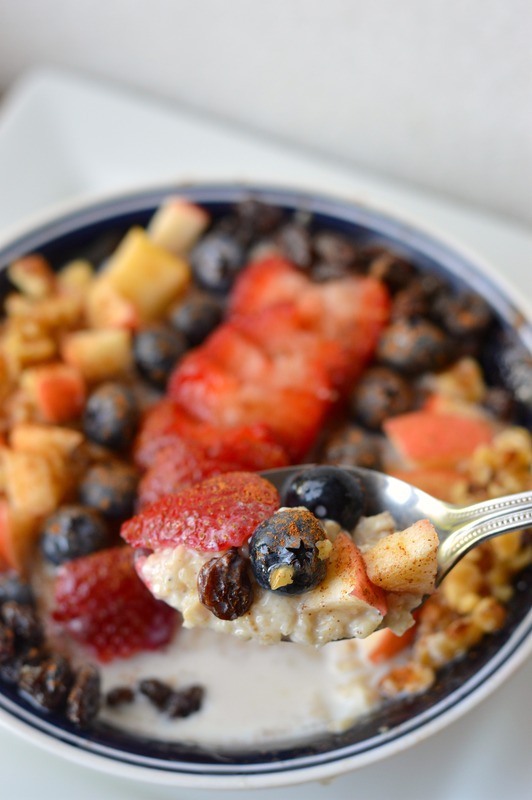 And by cooking it in milk and adding a splash of vanilla, right then we have a delightfully flavorful oatmeal that can even be eaten plain (lightly sweetened of course). That says a lot from a person like me! So yeah, I went from toppings with oatmeal, to being able to eat it plain if I have to. Of course, I always, always, add cinnamon no mater how I eat it (what’s oatmeal without cinnamon?) and I still love to add all sorts of toppings. I usually add whatever I have on hand. Here are some of the basics that I use (which I usually have on hand on a regular basis): honey to sweeten it, raisins, walnuts, any kind of fruit I have on hand, cinnamon, ground flax seed, and a little extra milk on top because who wants dry oatmeal? Not me! If there’s one thing I don’t like, it’s dry food. I know I probably sound like a very peculiar oatmeal eater, but I just need that little extra milk on top to keep everything juicy and moist. So that’s it folks! I know oatmeal is probably something people don’t even think about as a recipe, lots of people eat it all the time for breakfast. But for me, if it ain’t done right, I’m going right past it to something else. 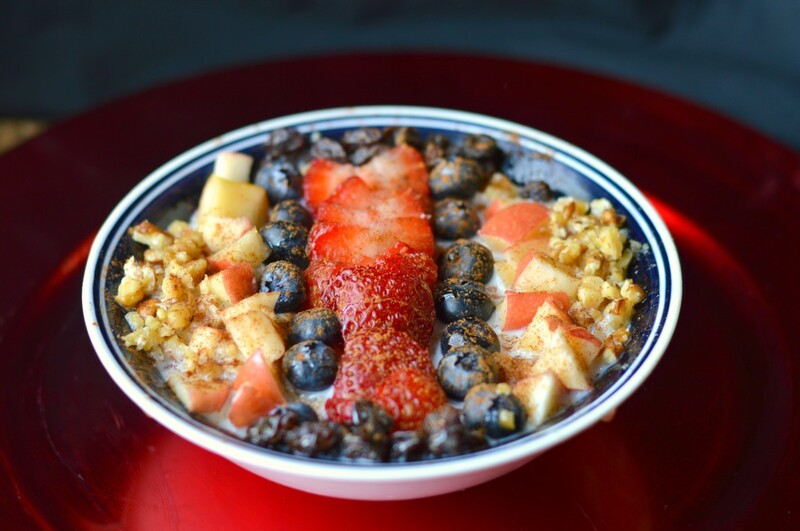 You just gotta have oatmeal done right! 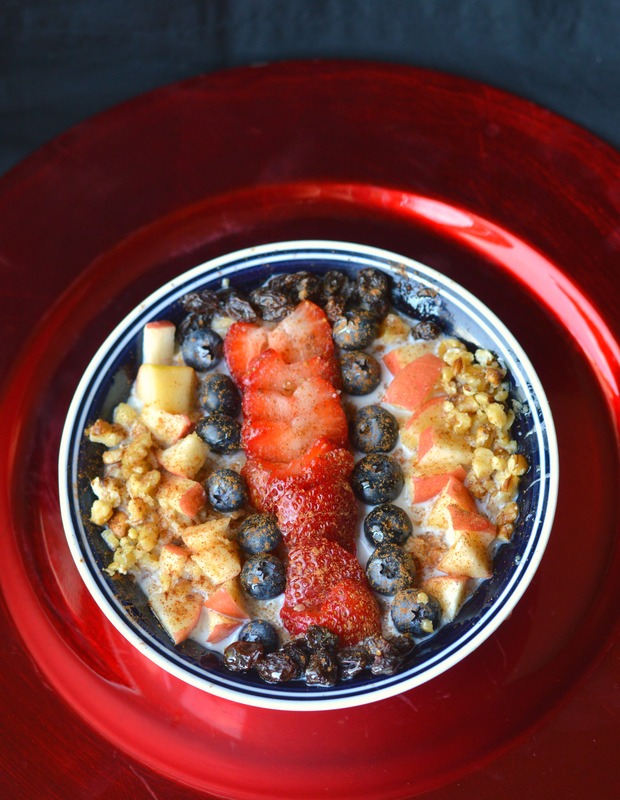 If you are the type of person who isn’t too fond of oatmeal, I hope you enjoyed this post and found some helpful tips on how to make your oatmeal a little more tasty. Now here’s exactly the order I prepare my oatmeal. Heat the milk in a saucepan until close to boiling point. Add the oats and stir. Keep stirring for about 3-5 min. until mixture thickens (how thick or runny you want it depends you). After oatmeal has thickened, transfer to a bowl. Add 1 tsp. of honey as well as the vanilla extract, and stir completely. Add the raisins, walnuts, and chopped fruit. Sprinkle the cinnamon according to taste. Drizzle on top the 1/2 tsp. of honey. Add a splash of milk around the edge of the bowl. Enjoy while it’s warm! 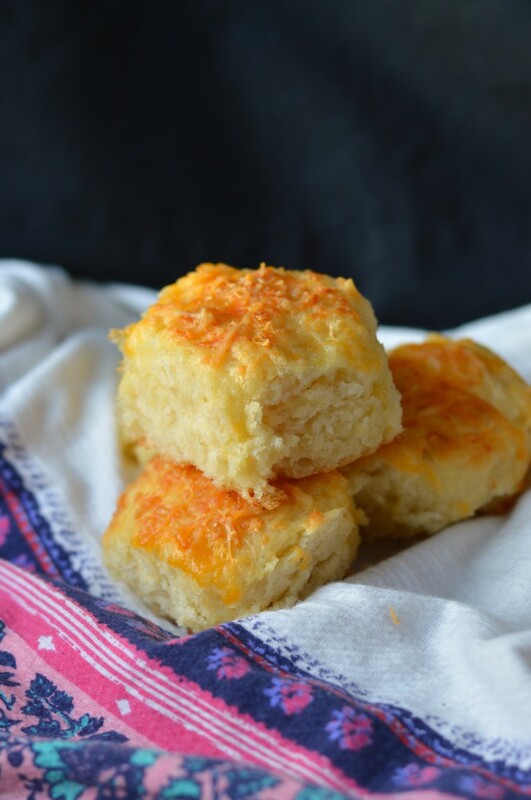 Taking these fluffy and delicious biscuits to a whole new level by adding cheddar and Parmesan cheese, and kefir! I love biscuits so, so much! 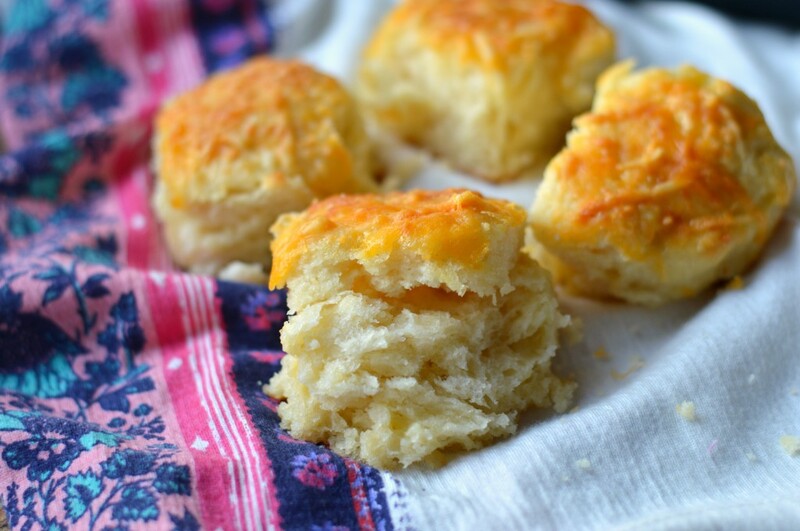 I’m not from the South, but I could eat biscuits morning, noon, and night I love them so!! 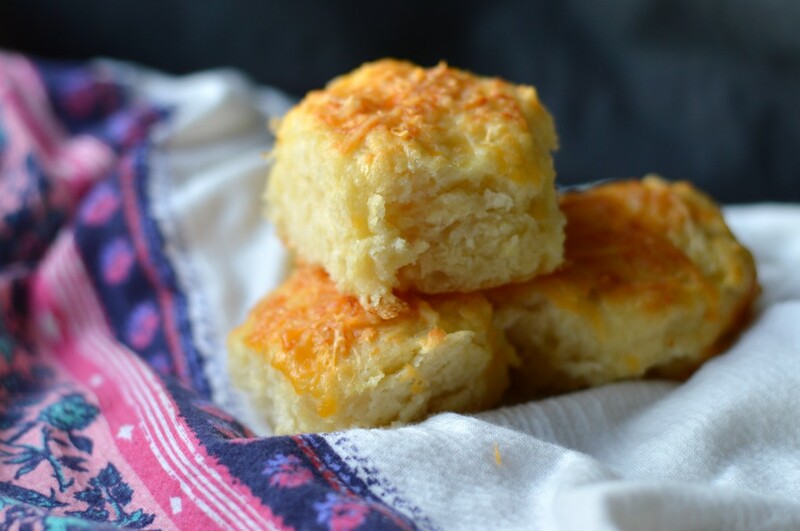 You can’t beat a good quality homemade buttermilk biscuits that’s flaky, fluffy, and a mile high thick! Especially when they’re warm…they’re the.best.thing.ever!!! My family looooves biscuits, and my 5-year-old sister recently had a craving for lots of biscuits. I didn’t mind having lots of biscuits for a few days in a row! I hope you give these cheesy, fluffy goodies a try, and let me know what you think! Preheat your oven to 450°F. Combine the dry ingredients in a bowl, or in the bowl of a food processor. Cut the butter into chunks and cut into the flour until it resembles course meal. If using a food processor, just pulse a few times until this consistency is achieved. Add the buttermilk and mix JUST until combined. If it appears on the dry side, add a bit more buttermilk. It should be very wet. Turn the dough out onto a floured board. Gently, gently PAT (do NOT roll with a rolling pin) the dough out until it’s about 1/2″ thick. Fold the dough about 5 times, gently press the dough down to a 1 inch thick. Use a round cutter to cut into rounds. You can gently knead the scraps together and make a few more, but they will not be anywhere near as good as the first ones. 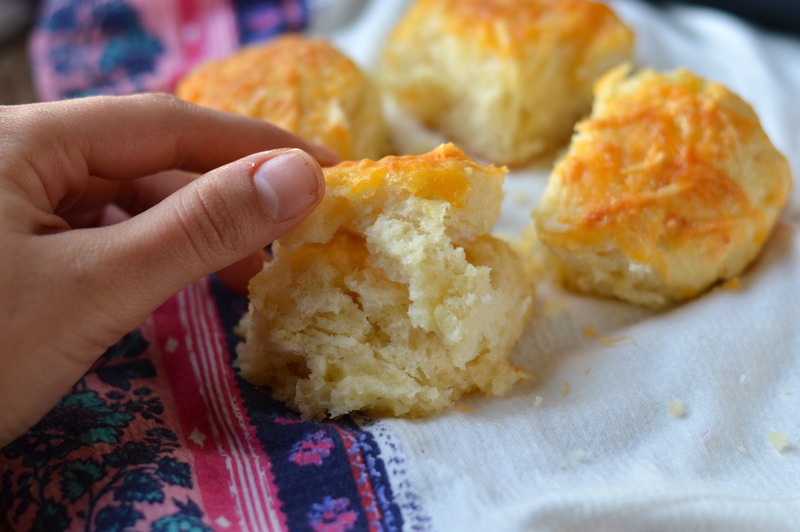 Place the biscuits on a cookie sheet- if you like soft sides, put them touching each other. If you like”crusty” sides, put them about 1 inch apart- these will not rise as high as the biscuits put close together. Brush the biscuits with some egg wash (1 egg beaten with a Tbsp. of water or milk). 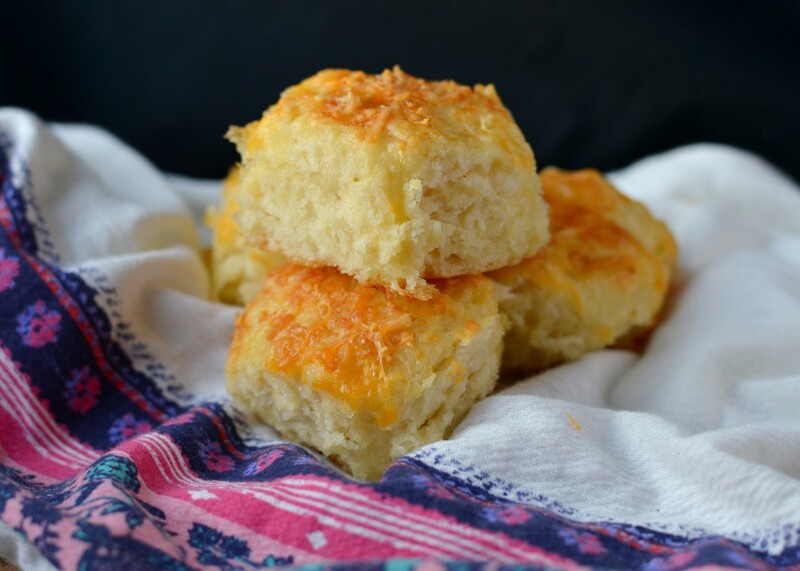 Evenly sprinkle the parmesan and cheddar cheese on top of the biscuits. 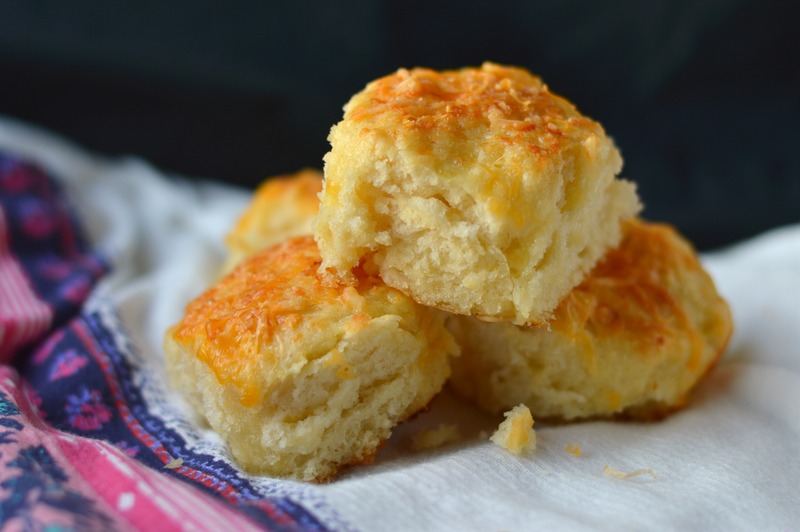 Bake for about 10-12 minutes- the biscuits will be a beautiful light golden brown on top and bottom. Do not overbake. Note: The key to real biscuits is not in the ingredients, but in the handling of the dough. The dough must be handled as little as possible or you will have tough biscuits. I have found that a food processor produces superior biscuits, because the ingredients stay colder and there’s less chance of overmixing. You also must pat the dough out with your hands, lightly. Rolling with a rolling pin is a guaranteed way to overstimulate the gluten, resulting in a tougher biscuit. Note 2: You can make these biscuits, cut them, put them on cookie sheets and freeze them for up to a month. 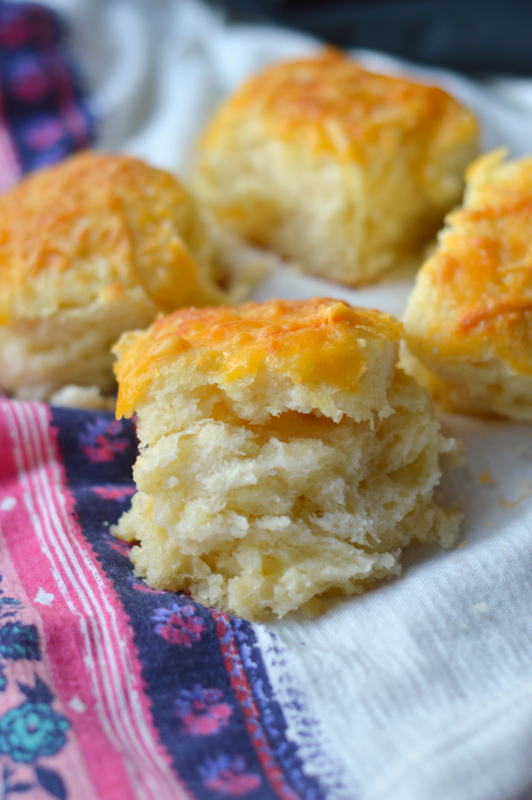 When you want fresh biscuits, simply place them frozen on the cookie sheet and bake at 450°F for about 20 minutes. It’s Pi Day! What could be better than celebrating by eating Pie! I jump at any occasion to make a dessert, whether it’s a birthday, a retirement party, anniversary, we’re having guests over, or observing a national holiday! I also love observing national food holidays! Also, my dad always told me that math is the most important subject in school, and one that should be given the most attention because it’s a foundation for many things. So I have acquired a respect and a like for math, even though there are times when it gives me trouble, and then I would rather be writing an essay or reading history. Last year was a remarkable Pi day since the date was 3/14/15 which has the exact numbers of Pi in order. Pretty cool eh? Ever since I heard about Pi day I loved celebrating with edible pie. 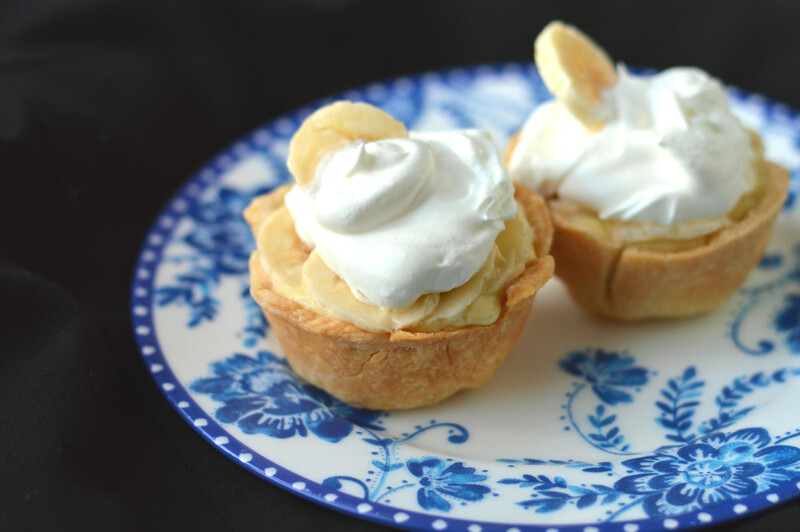 That way, if you miss pie day, you can celebrate late by making pie on Pi day! I can be very confusing sometimes! 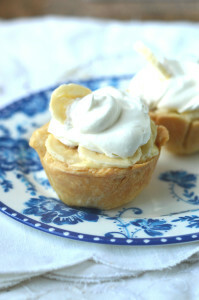 Anyways, lets leave out math for now and focus on something more delicious…banana cream pie!! And, it’s bitty bite! 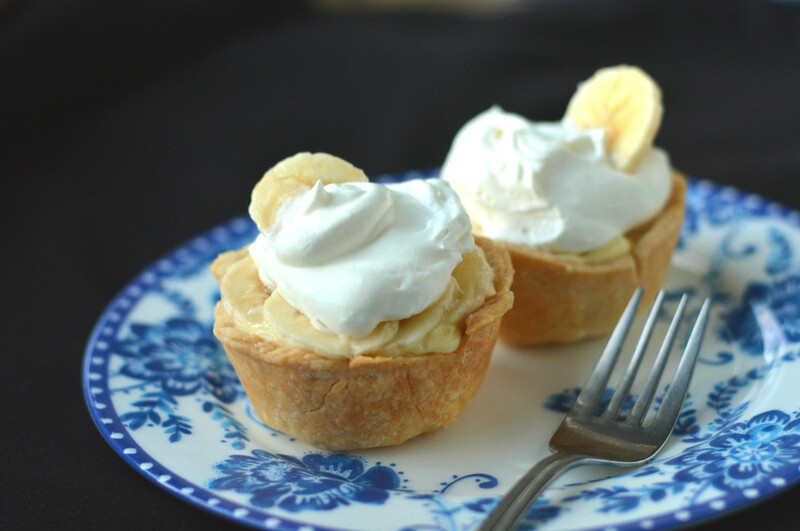 I’m a big pastry cream lover, and I also love banana desserts. 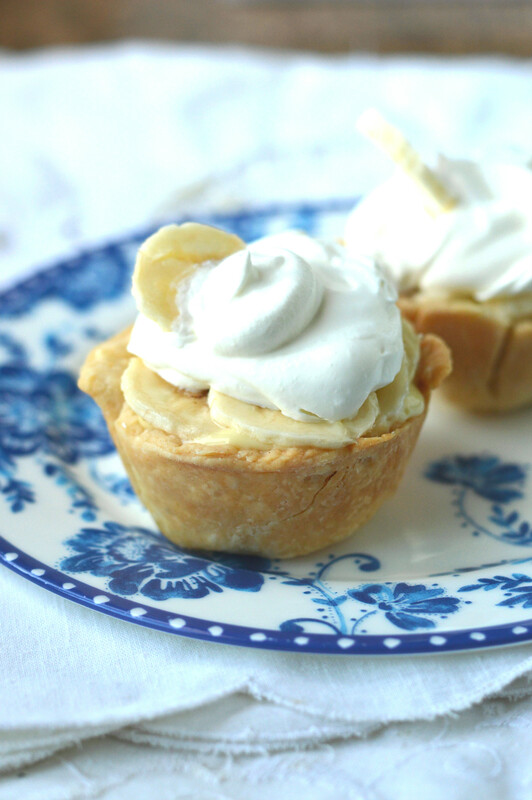 Those two put together make for such a great dessert, especially when you turn in into a pie! 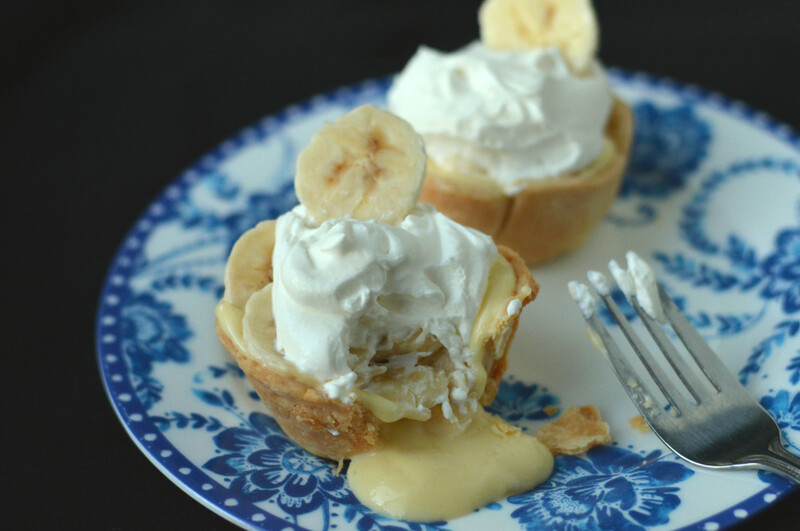 I once heard someone say that they loved banana cream pie more than chocolate. 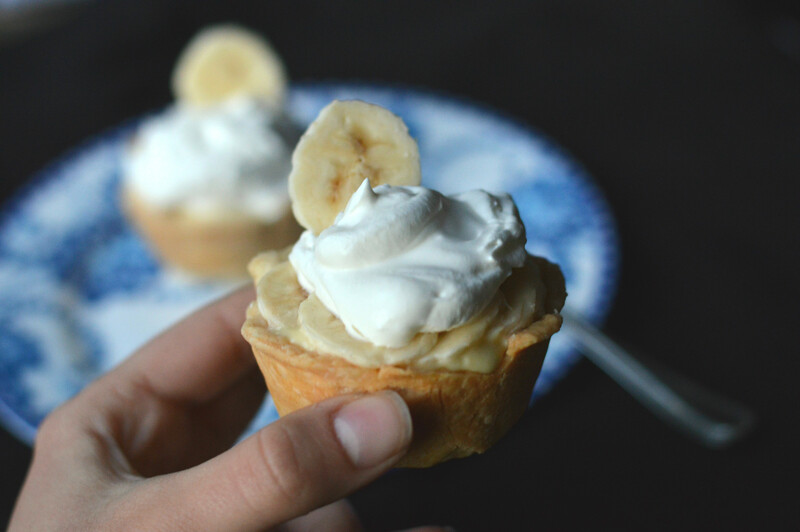 I’m not like that, there’s hardly anything that comes above chocolate, but I do treasure an amazing banana dessert recipe. And this is one of them! 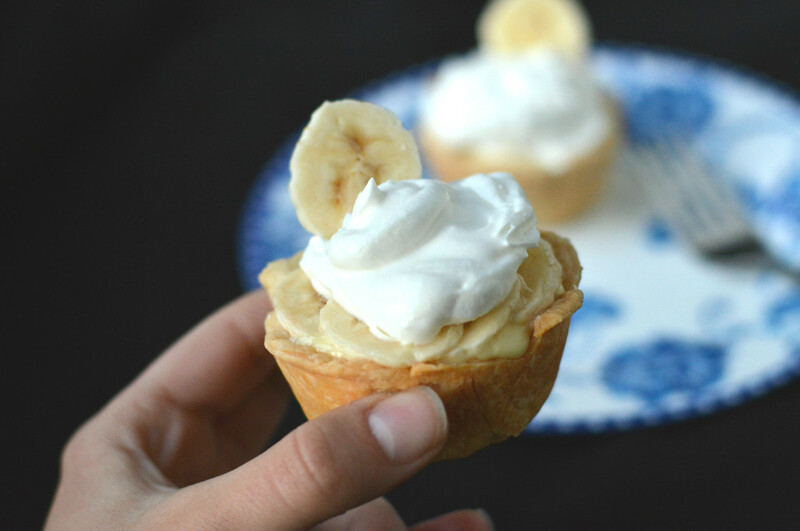 Oh, and don’t forget the whipped cream! 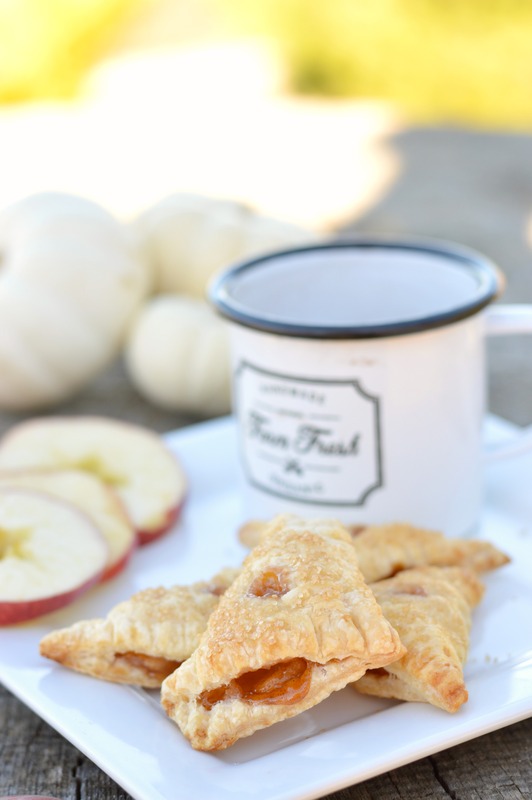 Your pies just wouldn’t be complete! Have A Sweet Pi Day! Place the water & the vinegar in the freezer. Meanwhile, cut the butter into the flour and salt with a pastry cutter. Add the vanilla, vinegar, and water, and mix until dough forms. If it’s too crumbly, add another tablespoon of water. Wrap the dough in plastic foil, and refrigerate it for at least one hour. In a medium-sized heatproof bowl, whisk the egg yolks with the sugar. Add the arrowroot powder, gelatin powder, and salt and mix until the eggs are pale yellow. Meanwhile, in a saucepan bring the milk just to boiling (the milk starts to foam up.) Remove from heat and slowly pour the milk into the egg mixture, whisking constantly to prevent the eggs from curdling (pour through strainer if necessary). Pour the egg mixture back into a medium saucepan and cook over medium heat, whisking constantly. When you see that the pastry cream is starting to thicken slightly, add the butter and vanilla and whisk until combined. Remove from heat and pour into a clean bowl and cover the surface with plastic wrap to prevent a crust from forming. Cool to room temperature and then refrigerate until firm. On a floured surface roll out your dough about 1/8 in. thick and cut out about 4 in. circles. Place each round piece of dough into a muffin pan. Cover each cup of dough with aluminum foil and place some beans or rice to weigh it down (we are blind baking the dough). Bake for about 10-15 min. at 350* or until lightly golden brown. Remove the shells from the oven and allow them to cool completely. To assemble the pies, spoon about 2-3 Tbsp. of pastry cream in each cup (about 3/4 full). 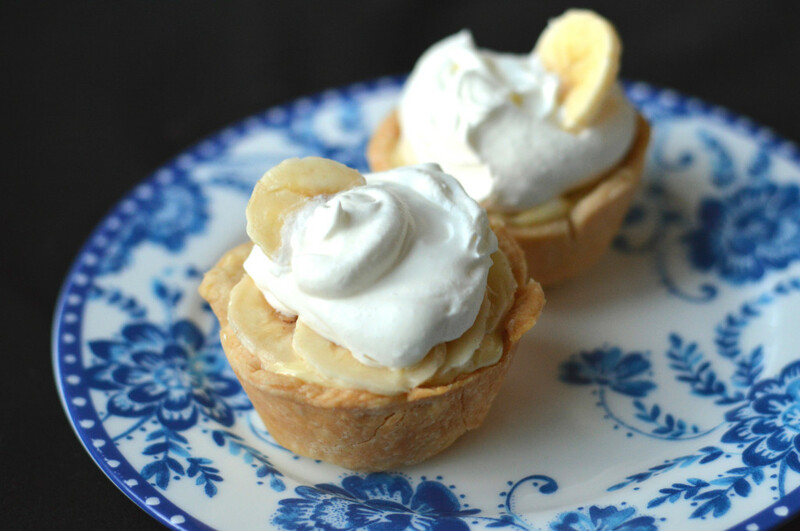 Top will sliced bananas and a dollop of whipped cream (to make the whipped cream, whisk together the heavy cream and powdered sugar until stiff peaks).